This is the graphic on the envelope we're sending to about 1900 people this week. Many are people who have sent donations in the past. Some have donated almost every year since 1993. Others are people who joined one of our events this year, or were added to the mailing by one of our staff. I wish I could be sending 100,000 of these, and a printed newsletter as well. We'd show pictures and videos from the Cabrini Connections program and the Tutor/Mentor Leadership and Networking Conferences. We'd show the maps we create and the art created by our students. We can't do this though because of the high costs of printing and postage and because we don't have that many names in our database. What we can do is share this information via blogs and social media and encourage friends, volunteers, supporters and strangers to visit our web sites, learn what we do, and forward this information to others. If enough people take time each day to use Twitter, Facebook, email and regular face-to-face networking to show the good work we're doing and how we share this with people all over the world, we feel many would go to our site to make donations and become benefactors. 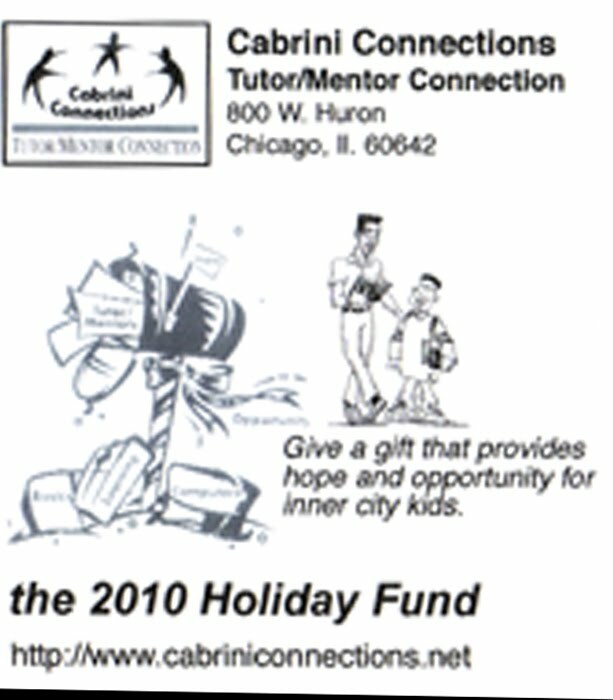 You can find a pdf of the 2010 Holiday Appeal letter and a response form here. Please help us share this throughout the Chicago region, the USA and the world over and over for the next 30 days. Thank you for helping us help inner city youth. Tribute to "life of tutoring and kindness"
Today's Chicago Tribune front page featured a stirring tribute to Sue Duncan, who "reached across segregated Chicago a half-century ago and through tutoring and uncommon kindness has changed thousands of lives". While she is the mother of Secretary of Education and former Chicago Public Schools CEO Arne Duncan, Sue Duncan is the hero of this story, as are all of the other volunteers who spend time in inner-city neighborhoods serving as tutors and mentors. The story ends with the statement "you only get so much time to do something positive with your life." b) Reach out to offer your time and talent to one or more of these programs. You can be a tutor/mentor, or can help with technology, fund raising, accounting, etc. Set up a group at your church or company to learn ways you can help programs throughout the city last long enough that they all can boast of long-term volunteers like Sue Duncan. c) Send a holiday donation to one, or more, and make a commitment to do so each year, in memory of the nearly 50 years that Sue Duncan has continued in her role as tutor/mentor. Make a bequest if you can, to assure long-term operations of the program you support. Tutoring Chicago and Chicago Tutor Connection are on that list, along with nearly 200 other youth serving organizations. Most don't have any wealthy benefactors supporting their efforts. They depend on an orchestra of donors and a variety of private sector grants. We also operate the Tutor/Mentor Connection, which maintains this list of tutor/mentor programs, and also depends on donor dollars to offer this free service. Don't wait until the end of December to get involved or send a donation. Do it today, or tomorrow. Add your own tribute to this life of "tutoring and kindness". Tribune says "Give us Ideas"
In it's 11/24/2010 editorial, the Chicago Tribune says to candidates aspiring to be the next Mayor of Chicago, "Give us Ideas". Remember when Ross Perot was running for President. He used charts and graphs to illustrate his ideas. 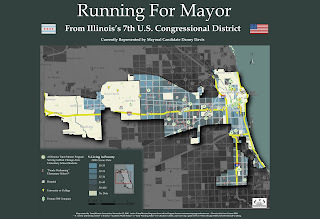 I've sent email to some of the candidates for mayor and alderman, encouraging them to use charts and maps in their campaigns, and if they get elected. For instance, they could use maps to show all of the high poverty areas in the city, where poorly performing schools are located, and where crime and violence is highest. They could add overlays showing community resources, like volunteer-based tutor/mentor programs (we could help with that). Then, they could talk about ways they would mobilize businesses, universities, faith groups from the city and suburbs to help populate each of the areas showing high need, with programs that will work to solve the problems of these neighborhoods. 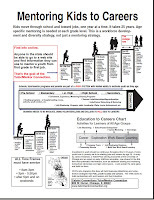 They could use charts like this to illustrate their vision of helping kids born or living in high poverty neighborhoods go through school and into college, vocational school, the military then into adult lives with productive jobs. These charts would allow them to emphasize the need for long-term solutions, and the involvement of many Chicago area residents over many years. They could even show that a youth entering first grade today is only going to be entering 4th grade when they are up for re-election and won't finish high school until they have served three full terms! Finally they could also show where they are outlining a vision and strategy that would lead to a wide range of constantly improving youth and community service organizations focused on this "birth to work" goal, and where they are documenting actions they and their boosters are taking every day to achieve that goal. We'd be happy to teach them to use the OHATS system we've developed to track our own actions toward this goal. Chicago faces a financial crisis. Its pension systems could go belly up in a few years, risking the retirements of city workers. Its schools, though they have made substantial progress, still fail too many children. Next mayor, what are you going to do about that? Look at this article on the BBC News web site. 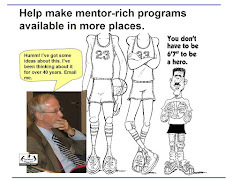 Now, do a Google search for the words "tutor mentor" and then click on "images". Look at some of the diagrams I've created and posted over the past 10 years. Can some of them be used to change the future? 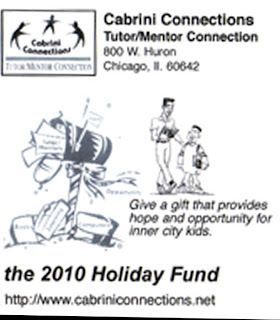 Visit Bradley Troast's blog to see the latest report showing impact of Cabrini Connections, a Chicago based non-school tutor/mentor program. You can also see a graphic showing 2009 revenue and expenses. Last Friday nearly 100 people gathered at U.S. Cellular Field in Chicago for a 34th Tutor/Mentor Leadership and Networking Conference since May 1994. Visit the conference site to see the list of speakers and agenda. 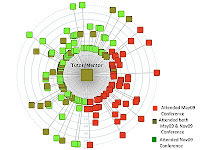 The graphic shown here illustrates how a small group of volunteers has been growing since the November 2009 conference when Valdis Krebs introduced Social Network Analysis with this presentation. 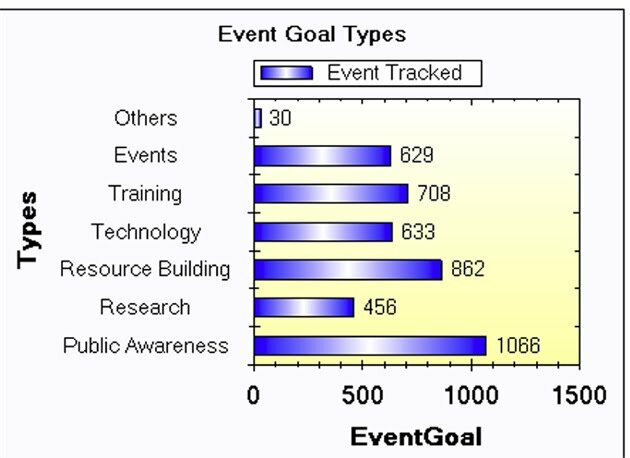 In the past year different volunteers have been learning to use SNA software to map the range of different organizations coming together at past conferences. This is one of the maps created since then, which you can see on this blog article. These network analysis maps are intended to illustrate the role of a tutor/mentor program, and the Tutor/Mentor Connection, of bringing together a wide range of people and organizations so they can each expand their own knowledge and networks, leading to an increased ability for tutor/mentor programs in different parts of Chicago and other cities to stay available to youth, and constantly improve their impact. I've written about conferences and network building in the past. I've also written about how difficult is to find the money to do this work as well as it needs to be done. I encourage you to read through the articles we've written. If you'd like to meet to learn more, just call 312-492-9614. If you see a way your company, foundation, faith group and/or university can help, or take a role, please get involved. This is one of the maps that will be on display during the Tutor/Mentor Connection's Mapping Solutions event, taking place from Nov. 15 to Nov. 27 at Webster Wine Bar in Chicago. These are tools leaders can use to mobilize citizens and the business community, and to distribute needed learning supports to K-12 youth in all high poverty areas of the Chicago region. The Tutor/Mentor Connection's celebration is part of GIS Day events taking place all over the world, to emphasize the importance of geography and the use of maps. Dan Bassill and Mike Trakin of the Tutor/Mentor Connection will be at Webster Wine Bar from 6pm to 9:30pm on Wednesday, November 17, to discuss uses of the maps, and to talk to potential sponsors, benefactors and volunteers. 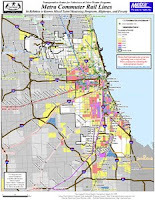 Call 312-492-9614 to schedule a meeting to discuss how you can use the maps, and help T/MC continue make this service available to people throughout the Chicago region. More government, or more maps? I encourage you to review this news release and report from the Institute for Higher Education Policy, titled: Multi-State Metropolitan Areas Face Unique Challenges and Require Innovative Solutions to Meet National College Completion Goals. The study recommends " the creation of an Educational Zone Governance Organization (EZ-GO) Commission"
Do we need one more layer of government bureaucracy? What if a network of non profits were created that used maps to show all the places where programs need to be in places to better prepare youth for college, and better support them into jobs and careers? 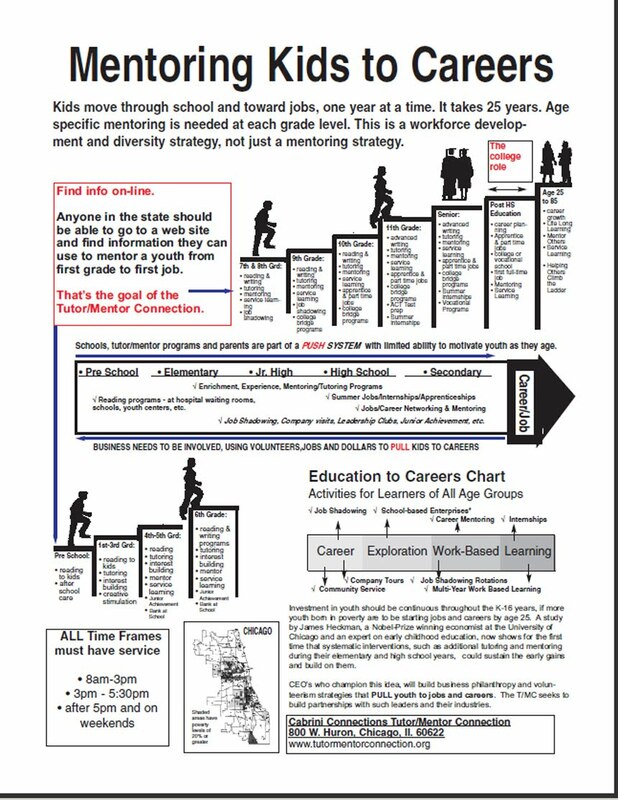 Below is a "mentoring-to-careers" chart created by the Tutor/Mentor Connection. It shows a long-term strategy that requires many owners, from business, higher education, government, the faith community and more. 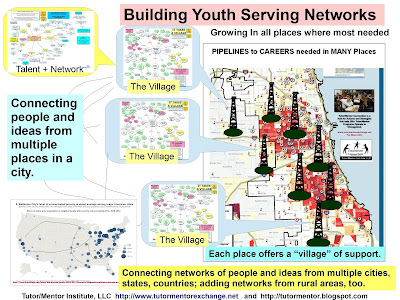 The "mentoring to careers" graphic includes a map showing all of Chicago. Below is an example of how small parts of the region can be mapped, to encourage local collaboration. 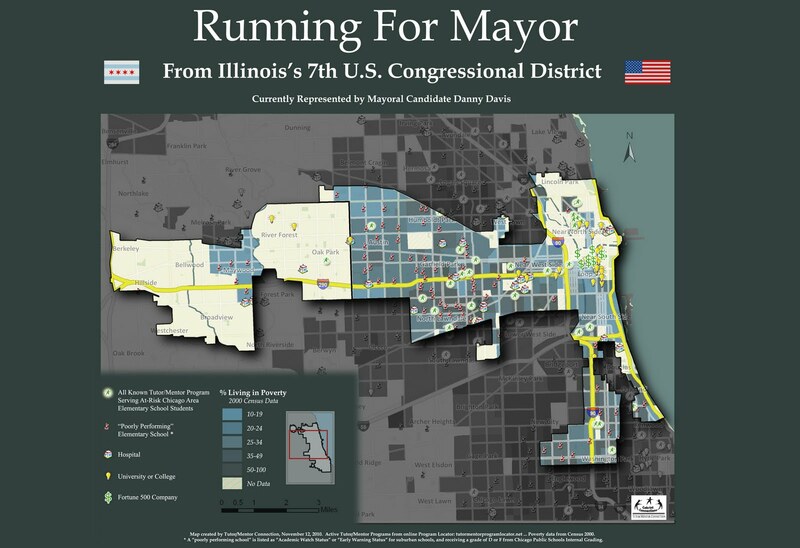 In this case we're showing the 7th Congressional District which has huge gaps between rich and poor. 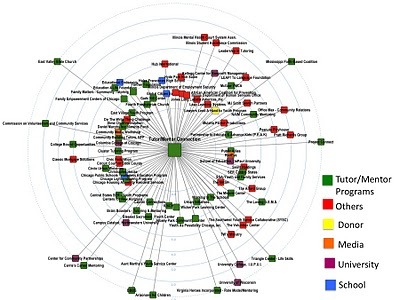 The map shows the places where industry, higher education, public leaders and citizens can work together to create first-grade to work mentoring, tutoring and learning strategies. 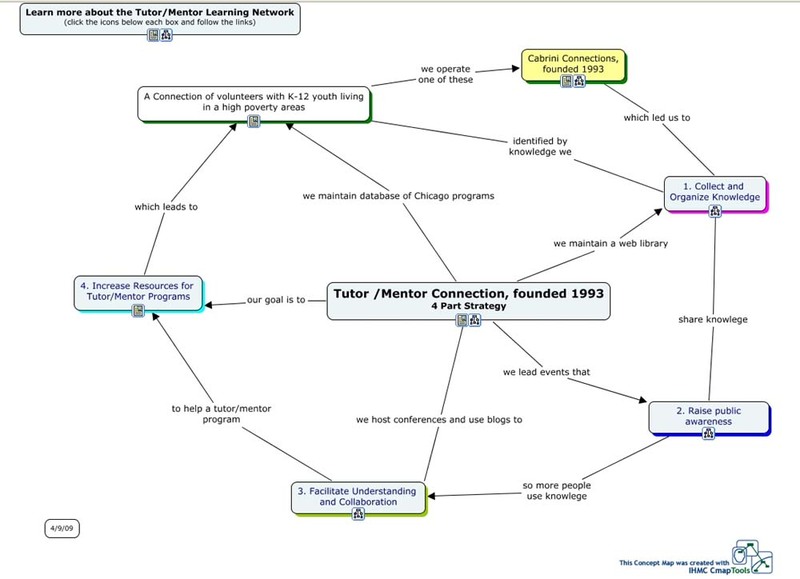 You can create your own map like this using the Tutor/Mentor Program Locator's Interactive map. Instead of creating one more layer of government decision makers, we propose funding for map-based portals that enable volunteers, donors, business leaders, etc. to choose what areas they want to support, based on where they do business, or where employees and/or customers are located, and based on where the need for education-to-careers support is greatest. 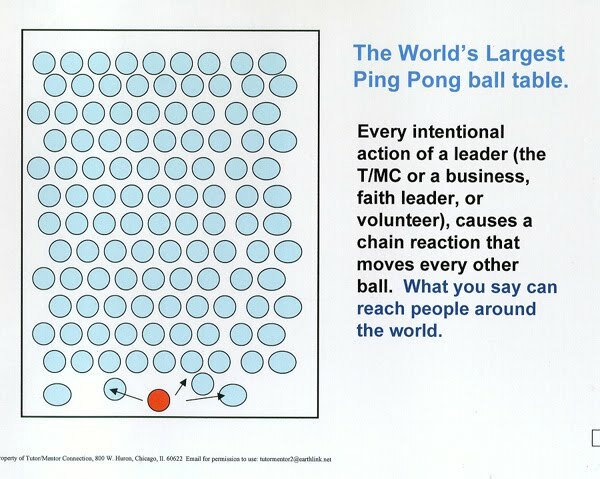 With the map on the internet, any leader can use this Role of Leaders strategy to mobilize volunteers and donors and point them to a wide range of programs, in many different parts of the Chicago region, or the Midwest. This does not need to cost millions of dollars. The T/MC Program Locator was created for under $50,000 and we're spending less than $50,000 a year to manage it. That's far too low for a city like Chicago, but it is far less than we'll spend if we add another layer of government over-site. Visit Mapping Solutions at Webster Wine Bar between Nov. 15 and Nov. 27 to see some of our maps. Come to the reception on Wednesday, Nov. 17 from 6-10pm and meet myself and Mike Trakan, our GIS map maker. 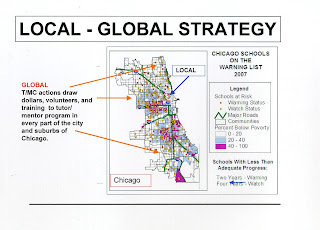 Learn how you can help keep this strategy available in Chicago as a model for the world. This is Cabrini Connections, This is Chicago. Please watch this video and show it to friends, co-workers and potential sponsors. For Cabrini Connections to be a place where inner city youth and volunteers from a wide range of business backgrounds can connect, we must find a wide range of donors and benefactors who help us pay the costs of rent, utilities, insurance, staff and program support. Once you look at the video and see what is happening in the Cabrini Connections space each week, visit our web site to see activities that take place throughout the year. Then look at the map below. Cabrini Connections served teens living in one small part of Chicago. The city has more than 200,000 k-12 youth living in poverty neighborhoods. The suburbs have a growing number of youth living in families where there are not adults modeling college and career opportunities that youth can aspire to, and that the nation needs to fill. 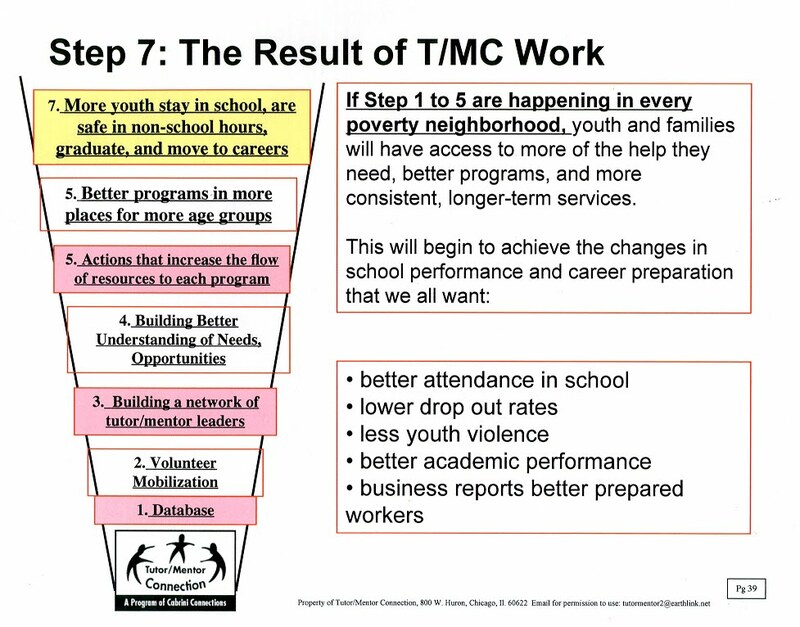 When you look at a map like this you should be able to click on the icons representing tutor/mentor programs, and go to web sites with videos just like this one, to see a wide range of mentors and learning supporting youth in that neighborhood. Note. you can visit the Tutor/Mentor Program Locator's interactive map and click on the green stars to learn about existing tutoring and/or mentoring programs in Chicago. You'll not find many with videos on their web sites showing how volunteers and youth are connecting to each other. Right now that's not possible because too many neighborhoods don't have programs like Cabrini Connections, and too few leaders in media, politics, religion, business and/or philanthropy are taking a proactive role in trying to provide the resources programs like Cabrini Connections need to get started in a neighborhood, then grow over 15 or more years to become established and effective at connecting youth with a wide range of volunteers. 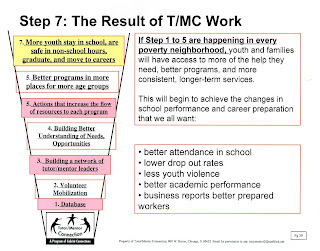 As we get set to elect a new Mayor and a new set of aldermen, look for evidence that these people can, and will, mobilize volunteers and donors to help build and sustain tutor/mentor programs in their districts, and in all of the high poverty neighborhoods shown on our maps. Next week we'll host two events focused on helping all tutor/mentor programs, including Cabrini Connections, find needed resources. Mapping Solutions, at Webster Wine Bar, starting Monday, Nov. 15 and running through Nov. 27. Tutor/Mentor Leadership and Networking Conference, Nov. 19 at U.S. Cellular Field from 8:30 am till 5:pm. At the end of the day a Waiting for Superman Panel will discuss the documentary movie and talk of how non-school volunteer-based tutor/mentor programs fit into the broad strategy of helping kids grow up and prepare for adult lives. If you want to come to the conference just for the panel discussion, we will not charge fees for anyone coming after 3:30pm. The panel starts at 4pm. LaFaye Garth, a 2009 graduate of Cabrini Connections, was one of the featured artist presenting films in Toronto's 2010 Regent Park Film Festival. See PDF announcement. Visit the Cabrini Connections Video Club blog and this page to learn more about how volunteers and youth are connecting and creating these opportunities. Donations from individuals, corporations and foundations make this possible. Please help. Read more. Imagine a future of philanthropy when "the innovations from the bottom will - and should - affect the thinking of the top." This is from a blog about the business of giving. Read more. Then think of ways leaders, volunteers,students, board members and current supporters of volunteer-based tutor/mentor programs can connect their messages so that more donors use this information to choose to invest their philanthropy in our sector. I'm sure I've written about this many times in the past, but if we want more kids to enter STEM careers, or live productive lives out of poverty, then we need to be building a network of people and organizations who share ideas and support each others efforts. This idea is explained in more detail in this pdf and on other essays that you can find on the Tutor/Mentor Institute site, and on past blog articles that I've written. The T/MC has hosted networking conferences in Chicago every six months since May 1994. The next will be November 19 at U.S. Cellular Field. 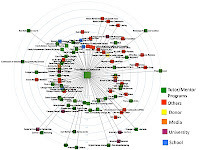 This blog shows how we're attempting to map the networking that is stimulated via the conferences. 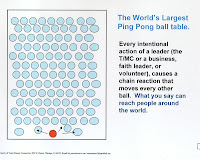 There are specific actions that need to be taken by many leaders, in many places, and repeated over and over for many years, if a network of purpose is to grow and achieve its purpose. 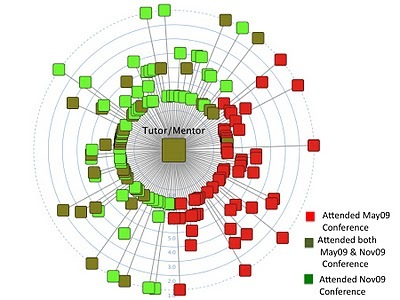 Read the articles in the Tutor/Mentor Connection OHATS(Organization History and Tracking System) section to see what these actions are and how leaders can hold themselves accountable for what they do. I received this email this week from Dr. J in Africa. On the Africa Group of our Ning page you can see how we're connecting others from Africa with our ideas and each other. Christian greetings to you our staff, donors, supporters and all prayer partners who has of helped and is helping TUTOR/MENTOR CONNECTION. This organization has been of a great benefit to Schools. We learn more as teachers and used all the lectures and teacher learning materials (T.L.M.) ideas and experience gained to educate our students. Tutor/mentor needs more funds to reach the unreached children in all over the world especially Africa, Asia and all under developed countries throughout the world. Hope you would do your possible best to assist tutor/mentor to become the world's famous organization where men and and women could acquire knowledge to help train the children to learn how to read and write to become great men of tomorrow. God bless you. When we created the T/MC in 1992 we did not realize we would be a resource for people in other parts of the world, but we did feel that most people who might use our services could not afford to pay us consulting fees. We felt that we could raise enough money from people who shared our vision of mentoring and tutoring and of helping disadvantaged youth to pay our bills. While we have been able to innovate and build the T/MC and provide ideas for people like Dr. Saforo, we have not been able to consistently raise enough money to support the T/MC and everyone we serve as well as we'd like. A survey done last spring by 3 Net Impact Chicago volunteers showed that of 10 mentoring partnerships in the US, the T/MC had the least amount of revenue and was supporting the largest regional population, but was doing some things, like our mapping and directory of programs, that no other city was doing. The survey still needs more work, but here is the initial report. Make a donation or a bequest to support the T/MC, and we can do more to support people like Dr. Saforo, as well as more than 200 tutor/mentor programs in the Chicago region. Read this blog article that provide reasons for Why Employee Volunteering Matters at AMD. Share with leaders in your own industry so the adopt these ideas and encourage participation in tutor/mentor programs throughout the Chicago region and in other cities. Here's an article on the Stanford Social Innovation Review titled "Straight Talk in Mixed Company: A Plea for Across-the-Aisle Conversations about Overhead"
One statement says "Explicit talk” between nonprofits and funders can sometimes be the rarest of commodities. I encourage you to read the article and follow the links and see if you can create a discussion circle with people from your own network. If we can't get the people who want to help poor kids out of poverty with the people doing the work, and the people collecting information that we can all learn from, how can we use scarce resources wisely? The Tutor/Mentor Leadership and Networking Conference is Nov. 19 at U.S. Cellular Field. This is a place where donors, researchers, politicians and business leaders could connect with tutor/mentor programs. We've not been able to achieve this yet, so our strategy is not one shared by all of those who need to have ownership.